RED BUTTERFLY BUG INSECT-HANGING FLYING MOBILE Yard Art Ornament Garden Decor Party Decoration. Colorful Assorted Birds and Bugs to entertain all ages. 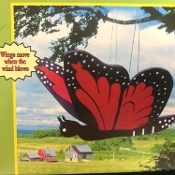 Wings move when the wind blows, or when gently tapped. Suitable for indoor or outdoor decorative use.